Earlier in the week we had a bit of cold snap. The forecast called for an Arctic blast that would drop below zero…how far was anyone’s guess. Tuesday night I went to bed a bit after 10 pm. At that time it was -34 and dropping. About 2 am I woke to add some wood to the fire, check the plumbing etc. 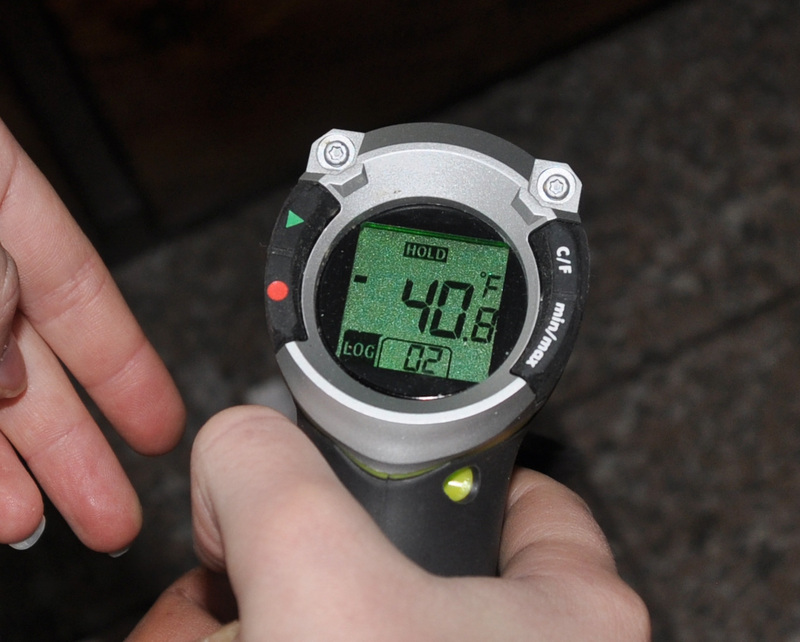 I grabbed the Digital IR temperature gun and took a reading…I was surprised to see -40.8. I hit the Hold button on the temp gun just to be sure. And I was whining about 25 below in the San Luis Valley… hope you and the house made it through the cold okay. We had a No flow situation in the downstairs bath the day after this when it warmed up to -18…fortunately I caught it before we went to bed, a little extra furnace action and opening up a wall saved us from any burst pipes…I just found out today that my brother had a burst line in his basement the other day..minor flooding. I’m down there nest week to patch some drywall that the plumber cut away for the repair.